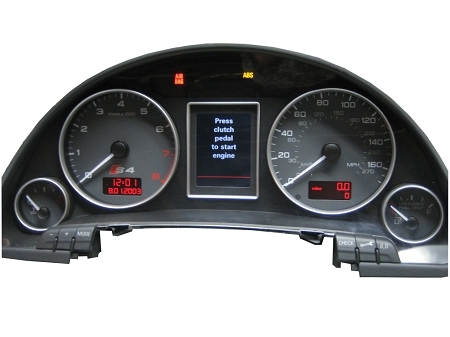 Audi B7 S4 Bosch RB8 Instrument Cluster - Part#: 8E0 920 981Q. Color Premium DIS Cluster with TFT display. The part is slightly used, but has been refurbished and restored to like new condition. There might be some minor imperfections on the lens from normal use or cleaning. 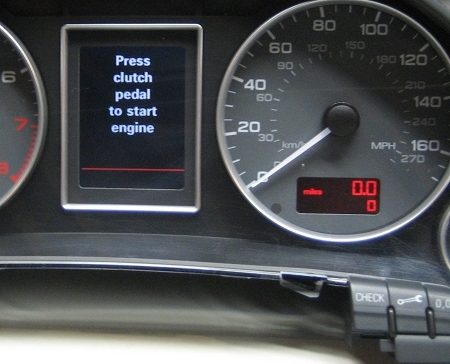 Installation possible by Cloning Service only, which requires shipping of existing instrument cluster in for configuration capture. Ross-Tech VCDS installation is not possible due to Immobilizer version, which is not supported. There is no coding by handshake method, as is the case with Immobilizer3 on Audi B6 A4/S4 models. We typically do not stock the Sedan or Convertible version of this cluster. Back-order status means that we need to source a desired donor cluster or build custom configuration, which may take up to a week to receive and process. Direct fitment and perfect upgrade for 2005.5-2008 Audi A4 models with red / monochrome display. Please contact us regarding availability and processing time. Cloning Service included in the cost of the instrument cluster.